Background: Gadolinium brain deposits after intravenous application of gadolinium-based contrast agents (GBCA) have been recently reported. Aim: We focused selectively on gadoxetate disodium, a hepatospecific linear GBCA. There are currently only a few studies in peer-reviewed literature focused selectively on gadoxetate disodium with conflicting results. Materials and Methods: Twenty patients (mean age 55.5 ± 14.0 years) after previous repeated administrations of gadoxetate disodium (mean 2.6 ± 1.5) for liver diagnostic process were included. All patients had normal renal and liver functions, an intact blood–brain barrier, and did not receive any other GBCA. They underwent 26 brain magnetic resonance imaging (MRI) with T1WI axial scans for signal intensity (SI) evaluation. The SI changes were measured in globus pallidus (GP), dentate nucleus (DN), pons (Po), and thalamus (Th) and SI ratios (DN/Po, GP/Po, GP/Th, Th/Po) were calculated. The control group consisted of 10 healthy volunteers (mean age 54.8 ± 12.1 years) with no prior GBCA applications. Statistical Analysis: Robust linear regression was used to test the effect of number of applications on the SI ratios. Results: The significant effect of number of gadoxetate previous applications on DN/Po SI ratio was found. On an average, the DN/Po ratio increased by 0.36 percentage points [P = 0.042, 95% CI (0.03, 0.69)]. Other SI ratios were not significantly affected. Conclusions: Repeated administrations of hepatospecific gadoxetate disodium leads to a statistically significant increase in the SI values in DN in patients with normal renal and liver functions, and with an intact blood–brain barrier, probably due to gadolinium deposition. Key Message: A statistically significant correlation between the number of gadoxetate disodium intravenous applications and the increase of signal intensity on T1 weighted MRI image in the dentate nucleus in patients with normal renal and liver functions, and with intact blood-brain barrier, suggests indirect signs of gadolinium deposits in the dentate nucleus. The long-term deposition of rare earth heavy metals, such as gadolinium and other members of the lanthanide elements, can be potentially toxic to the central nervous system. Gadolinium-based contrast agent (GBCA) for magnetic resonance imaging (MRI) examinations have been used since 1988, when the first GBCA was approved for clinical use. Gadolinium is a heavy metal, highly toxic in the biological system. For the purpose of its use as a contrast agent, it must be bound in the form of a chelate. Based on the chelate structure, GBCAs are divided into two basic groups, linear and macrocyclic. At first, GBCA had been considered safe even for the patients with chronic kidney disease. In those patients, contrast-enhanced MRI had been used instead of iodine-based contrast-enhanced CT examinations. The situation changed in 2006, when nephrogenic systemic fibrosis in renal dialysis patients was found to be associated with intravenous applications of GBCA and subsequent gadolinium accumulation. Nephrogenic systemic fibrosis is a disease of great variability that may produce manifestations ranging from mild to severe. It affects not only the skin but also other fibrous tissues, muscles, as well as parenchymal organs. The failure of parenchymal organs may even lead to the patient's death., Most of the cases have been linked to repeated intravenous applications of linear GBCA; majority of those cases have been either associated with gadodiamide or with gadopentetate dimeglumine. It has been postulated that in patients with renal insufficiency, the elimination of GBCA by glomerular filtration is significantly prolonged (>24 h) and the free gadolinium ion is released from the chelate structure, probably due to the process of transmetallation. Macrocyclic GBCAs are generally considered more stable and safer than linear GBCAs due to their ring-like ligand structure, forming a cage around the gadolinium ion, leading to a significantly slower dissociation rate. Recently, gadolinium retention in certain brain regions in patients with normal renal functions after multiple applications of GBCA has been reported, based on both MRI and histopathological findings., Although all brain regions appear to be affected to some extent, the greatest accumulation in the brain has been observed in the globus pallidus (GP) and dentate nucleus (DN)., The clinical relevance of this phenomena and the potential adverse effects are still unclear. The institutional information system was searched and patients who underwent liver MRI after the intravenous application of 10 ml of gadoxetate disodium (concentration 0.25 mmol/ml) were selected. From those patients, the following subjects were excluded: Patients with a history of any other GBCA applications beside gadoxetate disodium; those with abnormal renal functions (serum creatinine >130 mmol/l); those with abnormal liver functions; those with significant brain lesions (e.g., brain tumor, larger areas of ischemia, or chronic inflammation); and, those with any known neurological or psychiatric disorders. Twenty patients met the inclusion criteria and agreed to participate in the study. Those patients were referred for a native MRI brain examination (being termed as the contrast-enhanced group). The minimum interval between the unenhanced MRI brain examination and the last gadoxetate disodium application was set at 14 days. The control group was selected from healthy volunteers with no prior application of GBCA, who agreed to participate in the study. The study was approved by the institution's review board (number EK-VP/13/0/2017) and written consent from each of the included subjects was obtained. All brain MRI examinations were performed on the same diagnostic 1.5 Tesla MRI whole body equipment (Signa HDx 1.5 T, GE Healthcare, Milwaukee, USA) using HD 8 channel high resolution brain array. Axial T1WI (TR 500 ms, TE 10 ms, slice thickness 5 mm, matrix 320 × 224, number of slices 26, FOV 25 × 18.75 cm) were obtained for SI measurement. Axial T2WI (TR 4029 ms, TE 102 ms, slice thickness 5 mm, matrix 512 × 256, number of slices 32, FOV 24 × 18 cm) were obtained to exclude an incidental brain abnormality and to help with anatomical orientation. All subjects were independently evaluated by two radiologists (the first with a 6-year practice and the second with a 21-year practice in Radiology) using dedicated diagnostic software (Syngo.via, Siemens Healthineers, Erlangen, Germany). Both radiologists were blinded to the clinical data (number of previous gadoxetate disodium intravenous applications) and performed the assessment in random order. The following structures were selected for evaluation: DN, GP, thalamus (Th), and pons (Po). The mean SI values were measured from all selected structures on an unenhanced T1WI using an oval region of interest of defined size (0.5 cm2). [Figure 1] and [Figure 2] illustrate the measurement of the mean SI values. The following SI ratios were calculated: GP/Po, DN/Po, Th/Po, and GP/Th. Ratios for paired structures were calculated separately and averaged. Then, the calculated ratios obtained from both the readers were averaged and used for statistical analysis. All selected structures were also evaluated visually to determine whether or not there were any obvious visually detectable SI changes based on the experience of the radiologists. First, the agreement of radiologists’ measurements was assessed for each structure with the Spearman correlation coefficient. Then, both the groups (contrast-enhanced group and control group) were compared using averaged ratios from both the radiologists. Robust linear regression was used to test the effect of number of applications of the contrast on the SI ratios and report the slope coefficients corresponding to the average increase after one application. As a measure of effect size, we report 95% confidence intervals (CI). The results with P values <0.05 were considered significant. For clarity, the SI ratios are reported as percentages. 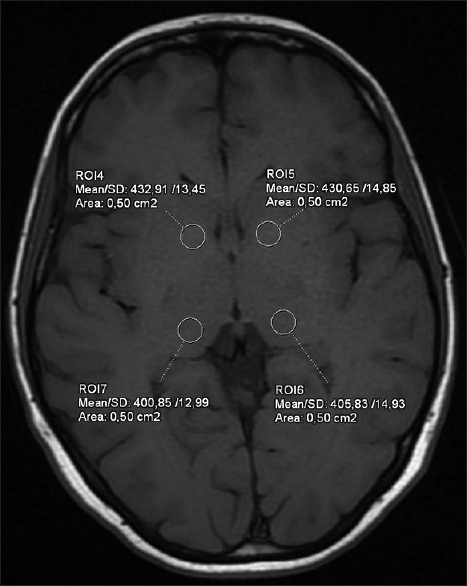 Four patients completed more than one brain MRI examination after subsequent gadoxetate disodium applications (two patients with two brain measurements, two patients with three brain measurements). Owing to the incomplete design, we treated these measurements as independent observations (resulting in 26 measurements in the contrast-enhanced group and 10 measurements in the control group). The contrast-enhanced group included 20 patients (9 men and 11 women, mean age 55.5 ± 14.0 years), who underwent a total of 26 brain MRI scans. The mean number of GBCA applications was 2.6 ± 1.5 (range 1–6). The time between the last GBCA intravenous application and SI measurement ranged from 2 weeks to 22 months. The indications for the previous liver MRI were as follows: 8 patients were examined for benign liver lesions (hemangiomas, focal nodal hyperplasia, and adenomas), and 12 patients for liver metastases. The control group included 10 participants; 3 men and 7 women (mean age 54.8 ± 12.1 years). The agreement of the radiologists’ measurements was calculated for each structure (Spearman ρ ranging from 0.974 to 0.988) and considered acceptable. We found a significant effect of the number of applications on the DN/Po ratio. On an average, the DN/Po ratio increased by 0.36 percentage points [P = 0.042, 95% CI (0.03, 0.69)]. For GP/Po, the average increase was not significant; the GP/Po ratio increased by 0.55 percentage points [P = 0.087, 95% CI (−0.06, 1.15)]. The increase in Th/Po ratio was not significant with an average increase by 0.34 percentage points [P = 0.166, 95% CI (−0.13, 0.81)]. 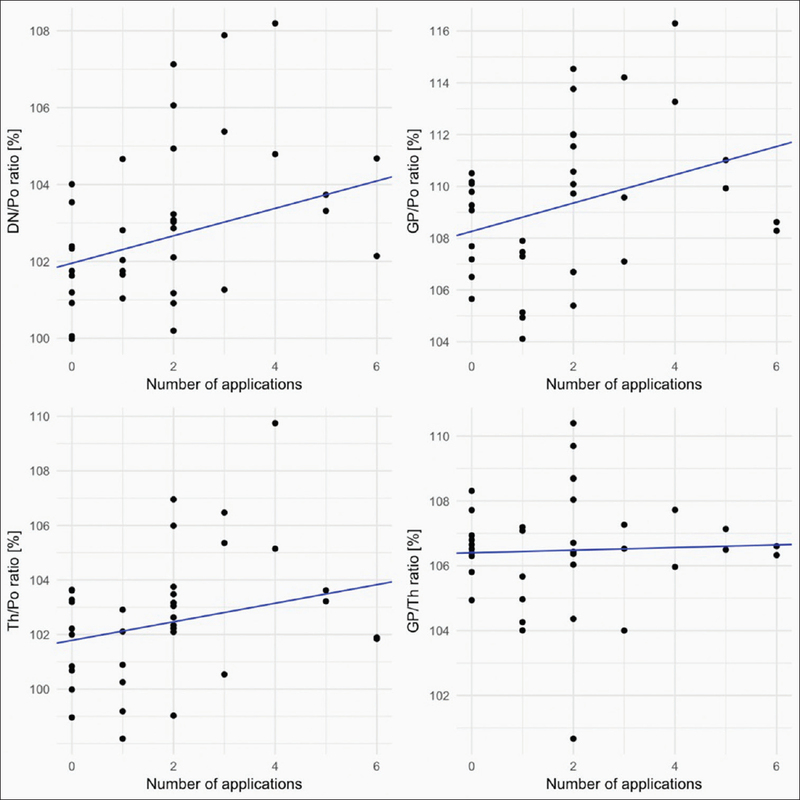 The GP/Th ratio was not affected by the number of applications [average increase 0.04 percentage points, P = 0.820, 95% CI (−0.31, 0.39)]. For more details, see [Figure 3]. The visual analysis was negative in all the selected structures. Our study shows a significant relationship between the number of gadoxetate disodium intravenous applications and an increase of the DN/Po SI ratio that suggests an indirect evidence of gadolinium accumulation in the DN, as detected by MRI. Our observation is in concordance with previous studies focused on linear GBCA. In our study, the SI increase as the sign of gadolinium accumulation was discreet, as visual assessment was negative in all cases, which is probably due to the small number of included patients and the small number of gadoxetate disodium applications. However, this could also have been due to the relatively higher stability of gadoxetate disodium in comparison to other linear GBCAs. The most significant gadolinium depositions were reported after applications of non-ionic GBCA, while gadoxetate disodium is an ionic GBCA. Gadoxetate disodium is a hepatospecific GBCA, with approximately half of its excretion occurring through the hepatobilliary tract, which could improve its general excretion rate. In our study we used the methodology postulated by previous imaging and histological studies., Those studies have proven the existence of a correlation between the SI increase on T1WI and gadolinium accumulation in selected brain structures and introduced the use of DN/Po and GP/Th ratios for MRI evaluation. One of the most commonly used markers for gadolinium brain deposit evaluation is the GP/Th ratio, but in our results, this ratio was not significantly affected. 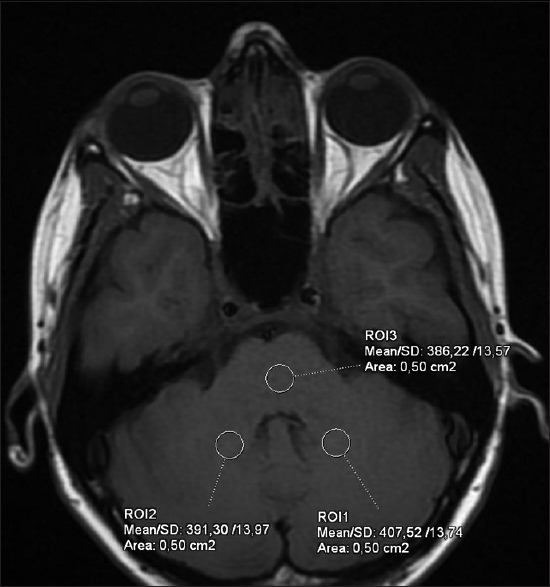 This could be caused by similar gadolinium accumulation in both the structures, which would correlate with previous histological studies that found significant gadolinium accumulation in the pulvinar thalami., Most of the previous studies also do not specify the exact location of the SI measurement in the Th. For those reasons, we believe that it is better not to use GP/Th ratio for evaluation of the gadolinium brain deposits. We suggest using Po as a reference structure and found the GP/Po and DN/Po ratios to be more accurate. Other studies also use cerebrospinal fluid as the reference point,, but we believe that it is not suitable due to the flow artifacts, and the difficulties that arise on using a sufficiently large region of interest in the narrow ventricles. To the best of our knowledge, there are only three studies in peer-reviewed literature focused on gadoxetate disodium, and they reached different conclusions.,, Kahn et al., found a positive correlation between the DN/Po ratios and the number of previous gadoxetate disodium administrations, and a significant difference of the DN/Po ratios between the control subjects and the patients after more than 10 gadoxetate disodium applications, suggesting gadolinium retention. Those findings are partially similar to our study. We also found a positive correlation between the DN/Po ratios and the number of previous gadoxetate disodium administrations. In comparison with the mentioned study, our study group was smaller (20 patients with 26 MRI measurements in our study versus 91 patients in the study of Kahn et al.) and we studied a smaller number of gadoxetate disodium applications (the maximum numbers of GBCA applications were 6 in our study versus 37 in the study of Kahn et al.). However, the study of Kahn et al., suffered from several limitations. They included patients with liver cirrhosis, which can cause manganese depositions and subsequent T1 hyperintensities in basal ganglia. Also, patients with up to two applications of different macrocyclic GBCA in personal history were found in their study. Their examinations were performed on two different MRI equipment with slightly different pulse sequences, and they also had a significantly different mean age between the study group and the control group. The second study by Conte et al., came to a different conclusion. They found no significant SI changes in DN or GP. This study included a similar number of patients as found in our study, but with a higher number of gadoxetate disodium applications (range 2–18). They did not use the control group; instead they used a prospective design comparing MRI before (as a baseline) and after each gadoxetate disodium application. The differing results between the study by Conte et al., and our study could be attributed to the different designs of both the studies, as well as the smaller number of the included patients, which is also the main limitation of both the studies. The third study by Ichikawa et al., compared the SI in DN after repeated (five and more) gadodiamide and gadoxetate disodium intravenous applications. They came to the conclusion that repeated applications of gadoxetate disodium did not cause a SI increase in DN as opposed to gadodiamide. However, they included cirrhotic patients, and applied very low doses of gadoxetate disodium (four times lower than gadodiamide dose per one application). The toxicity of free gadolinium ion may be due to its insolubility at physiologic pH causing a slow systemic excretion, and a crystal size similar to that of calcium ions that allows small amounts of the free gadolinium ions to compete biologically with calcium ions. Long-term retention of gadolinium may lead to benign neoplasms and fatty degeneration of the liver. Competition with calcium ions may interfere with the functioning of the angiotensin-converting enzyme system, may cause macrophage inhibition, neurotoxicity (especially the inhibition of neuromuscular transmission), and cardiovascular effects. However, the levels of free gadolinium ion that may cause toxicity in human beings is still not known. When compared with the previously mentioned studies,,, our study has several advantages. We performed a strict selection of subjects. We excluded all those patients who had undergone previous application of any other GBCA, as well as patients with potentially damaged blood–brain barrier. Patients with renal or liver insufficiency were excluded as well, just as patients with liver cirrhosis were, due to the potential for manganese accumulation in brain structures in the latter group. All patients and control subjects were examined by the same MRI equipment and MRI protocol to avoid a technical bias. Evaluation was performed independently by two radiologists with no knowledge of the number of previous GBCA applications. However, the major limitation of our study was the small number of included patients. The amount of gadoxetate disodium used for one examination at our department was also routinely set at 10 ml and not adjusted to the patients’ body weight. For MRI measurements, we used an unenhanced spin echo T1WI with a section thickness of 5 mm. DN is a small structure, and therefore, our results may also have been influenced by the partial volume effect artifact. We found a statistically significant correlation between the number of intravenous applications of gadoxetate disodium and the increase of SI on T1WI in the DN in patients with normal renal and liver functions, and with a intact blood-brain barrier, suggesting the presence of indirect signs of gadolinium deposits in the DN. Authors Michal Holesta, Jiri Weichet, Monika Grilli Wagnerova, and Hana Malikova were supported by the Charles University (Czech Rep.) research program PROGRES Q37/Q28. Jiri Lukavsky was supported by RVO68081740/Strategie AV21 of the Czech Academy of Sciences. The authors of this study have no disclosures to make. Hao D, Ai T, Goerner F, Hu X, Runge VM, Tweedle M. MRI contrast agents: Basic chemistry and safety. J Magn Reson Imaging 2012;36:1060-71. Morcos SK, Haylor J. Pathophysiology of nephrogenic systemic fibrosis: A review of experimental data. World J Radiol 2010;2:427-33. Grobner T. Gadolinium-a specific trigger for the development of nephrogenic fibrosing dermopathy and nephrogenic systemic fibrosis? Nephrol Dial Transplant 2006;21:1104-8. Marckmann P, Skov L, Rossen K, Dupont A, Damholt MB, Heaf JG, et al. Nephrogenic systemic fibrosis: Suspected causative role of gadodiamide used for contrast-enhanced magnetic resonance imaging. J Am Soc Nephrol 2006;17:2359-62. Agarwal R, Brunelli SM, Williams K, Mitchell MD, Feldman HI, Umscheid CA. Gadolinium-based contrast agents and nephrogenic systemic fibrosis: A systematic review and meta-analysis. Nephrol Dial Transplant 2009;24:856-63. Rogosnitzky M, Branch S. Gadolinium-based contrast agent toxicity: A review of known and proposed mechanisms. Biometals 2016;29:365-76. Murata N, Gonzalez-Cuyar LF, Murata K, Fligner C, Dills R, Hippe D, et al. Macrocyclic and other non-group 1 gadolinium contrast agents deposit low levels of gadolinium in brain and bone tissue: Preliminary results from 9 patients with normal renal function. Invest Radiol 2016;51:447-53. Malikova H, Holesta M. Gadolinium contrast agents - are they really safe? J Vasc Access 2017;18(Suppl 2):1-7. Kahn J, Posch H, Steffen IG. Is there long-term signal intensity increase in the central nervous system on T1-weighted images after MR imaging with the hepatospecific contrast agent gadoxetic acid? A cross-sectional study in 91 patients. Radiology 2017;282:708-16. Conte G, Preda L, Cocorocchio E. Signal intensity change on unenhanced T1-weighted images in dentate nucleus and globus pallidus after multiple administrations of gadoxetate disodium: An intraindividual comparative study. Eur Radiol 2017;27:4372-8. Ichikawa S, Motosugi U, Omiya Y, Onishi H. Contrast agent-induced high signal intensity in dentate nucleus on unenhanced T1-weighted images. Comparison of gadodiamide and gadoxetic acid. Invest Radiol 2017;52:389-95. Frenzel T, Lengsfeld P, Schirmer H, Hütter J, Weinmann HJ. Stability of gadolinium-based magnetic resonance imaging contrast agents in human serum at 37 degrees C. Invest Radiol 2008;43:817-28. Ramalho J, Castillo M, AlObaidy M, Nunes RH, Ramalho M, Dale BM, et al. High signal intensity in globus pallidus and dentate nucleus on unenhanced T1-weighted MR images: Evaluation of two linear gadolinium-based contrast agents. Radiology 2015;276:836-44. Kanda T, Nakai Y, Oba H, Toyoda K, Kitajima K, Furui S. Gadolinium deposition in the brain. Magn Reson Imaging 2016;34:1346-50. Radbruch A, Weberling LD, Kieslich PJ, Hepp J, Kickingereder P, Wick W, et al. High-signal intensity in the dentate nucleus and globus pallidus on unenhanced T1-weighted images: Evaluation of the macrocyclic gadolinium-based contrast agent gadobutrol. Invest Radiol 2015;50:805-10. Weberling LD, Kieslich PJ, Kickingereder P, Wick W, Bendszus M, Schlemmer HP, et al. Increased signal intensity in the dentate nucleus on unenhanced T1-weighted images after gadobenate dimeglumine administration. Invest Radiol 2015;50:743-74. Klos KJ, Ahlskog JE, Kumar N, Cambern S, Butz J, Burritt M, et al. Brain metal concentrations in chronic liver failure patients with pallidal T1 MRI hyperintensity. Neurology 2006;67:1984-9. Kanal E, Tweedle MF. Residual or Retained Gadolinium: Practical Implications for Radiologists and Our Patients. Radiology 2015; 275. Available from: https://doi.org/10.1148/radiol. 2015150805. [Last accessed on 2018 Oct 21].